Excel documents are not primarily designed for printing, so it’s pretty common to encounter situations where a spreadsheet printout is kind of a mess. 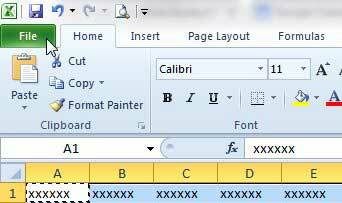 Whether all of your cell contents seem to run together, or column headers don’t print on anything but the first page, Excel’s default print settings need to be adjusted in most situations. But perhaps one of the biggest problems is when your spreadsheet has a couple more columns than will fit on one page, so Excel forces them onto a second page. This can easily turn a ten page document into a twenty page document, which you will then either need to fix and reprint or tape together. But there is a simple way to fix this on the Print menu and save yourself some paper. Looking for a simple backup solution? Start with this external hard drive and create backup copies of important files you can’t afford to lose. One important factor to be aware of before you do this is that Excel will force all of your columns onto one page, regardless of how small that might make the text. So whether you have 12 columns or 120 columns, they will all be forced to one page. If fitting everything to one page is not realistic, then you might be better served by switching the page orientation, hiding unneeded columns, or printing in landscape orientation on legal paper. 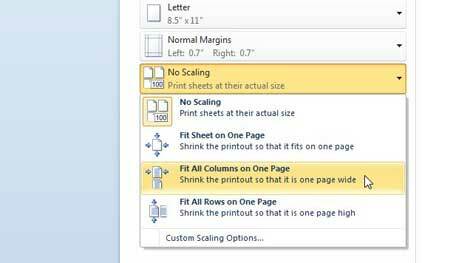 But if you just have a couple of columns that aren’t fitting on a page, follow the steps below to have all of those columns print on one page. Step 4: Click the No Scaling button in the center column, then click the Fit All Columns on One Page option. 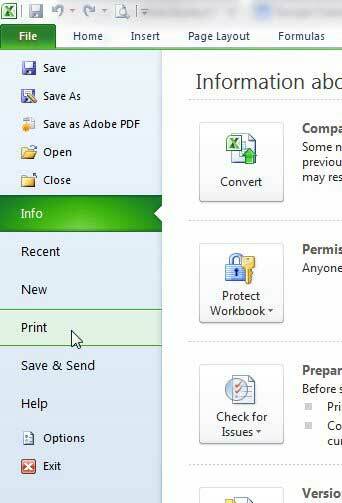 Step 5: Click the Print button at the top of the window. If the ink for your printer is expensive, then you might be able to save some money by purchasing it from Amazon. Visit their Printer Ink store and check pricing on ink for your printer. There are other ways to improve the appearance of Excel printouts, including this method for fitting a spreadsheet to one page.